=> Zona X "Lauren Mohlie"
=> Promotores de Lectura "Barrilete Viajero"
Visita nuestros amigos en la Red! Tenemos nuevos personajes para la hora del cuento, los niños han conocido a nuestro nuevo amiguito "popotito" quien ahora los acompaña en las increibles horas de cuento que los promotores de lectura realizan. La hora del cuento es el alma de la biblioteca, actividad que se realiza dos o tres veces por semana los dias: martes, miercoles y viernes, por la bibliotecaria y la Vocal de Lectura. 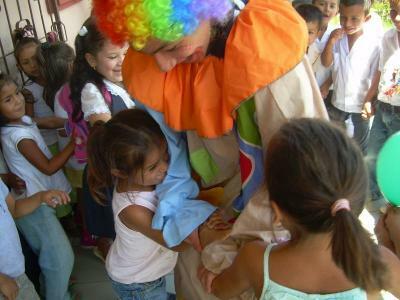 * fomenta la lectura infantil. * nos miran como modelos de lectura. ¡Si queremos que lean, tenemos que leer! * fortalece las habilidades de observación. * ofrece amigos nuevos porque los personajes son muy verdaderos. La hora del cuento se ha convertido en la actividad mas importante en nuestra biblioteca no solo por el hecho de llamar la atención con ella, sino que ha creado motivación y espiritu de descubrimiento en los niños que asisten, esta actividad ha venido a eliminar la barrera que existia entre el niño y la lectura por diversión, se sienten personitas importantes al saber que alguien quiere leerles en voz alta, así fomentamos la lectura en ellos. Descubre ademas sus talentos haciendo manualidades y otras actividades después de leer el cuento. It was good to read such a quality content. Thanks for your information about this particular topic. It was so nice to read about this all stuff. Thanks for your input in this regard. The article which is given here is very nice and helpful information. Congratulations on your brilliant success. Nobody prevails at everything constantly. There will be difficulties and disappointments, feedback and torment. Utilize these obstacles as learning encounters as opposed to harping on the occasions as disappointments or dissatisfactions. The familiar saying, "Attempt, attempt, attempt once more," has justify, particularly in showing kids not to surrender. But on the other hand, it's imperative to approve your kid's emotions as opposed to stating, "Goodness, simply brighten up," or, "You shouldn't feel so terrible." This causes kids figure out how to confide in their sentiments and feel great sharing them. Youngsters will discover that difficulties are an ordinary piece of life and can be overseen. In the event that your tyke does inadequately on a test, don't cover him with pity or reveal to him that he'll never be a decent peruser. Rather, discuss what steps he can take to improve the situation next time. When he succeeds, he will take pride in his achievement. The measure of the expense is distinctive for each organization, so request that few organizations locate the most minimal charges. great for students thank you for information. I have only one thing to say that I am feeling very amazed after reading your blog because of its content and presentation which you don't see nowadays in a blog. In my point of view, you have worked very hard to done it in a perfect way, so keep sharing more and more in future also. After searching many blogs I visited your in search of some unique content and one of a kind information for my personal growth and I must tell you I am very glad that I visited your blog you have just pulled a very interesting blog in such a way that it keep my interest till the last. I have one request if possible then please share blog like these on daily basis. Only wanna tell that this is very useful.Thanks for taking your time to write this. You really make it seem so easy with your presentation but I find this topic to be really something which I think I would never understand. It seems too complicated and very broad for me. Gracias por la prestación de orientación beneficioso, seguro, educativo y divertido, así! The broader issue is that without any real audit process, these figures are likely to be the tip of the iceberg. 15 Mud, 16. trois de leurs joueurs, a mené sa politique. Victims should uninstall the Cyberoam CA certificate from their browsers and decline to complete any connection which gives a certificate warning, the Tor researchers advise consumers. Dallas came out flying, running out to a 14-2 lead and looking every bit like the team that has dominated Miami since the start of the 2004-05 season, and the Mavericks' zone defense was giving the Heat fits. It is to his credit that he has approached the job with an acute sensitivity to his political limitations. The institutionalising of government by consensus, centred around the deepening personal relationship between Mr Cameron and Mr Clegg, must be recognised as his signal achievement. It has set the tone and style for the rest of the Coalition, its benefits felt from the motor of the Treasury to the outer cogs of remoter departments. It is that remarkable collaborative approach between Tory and Lib Dem ministers that has delivered significant victories in the vital areas of deficit reduction, welfare reform and improving schools. The last demo was of a futuristic driving yoke that had a slot for a tablet. It looked more like a gamer driving yoke than a traditional steering wheel. The tablet and car communicate, trading info on where you want to go and how to take you there. The tablet can also store your media and play it through the car audio system. Plus the tablet could be used to provide compute, storage, and I/O resources for any apps in use during the drive. Laurence Olivier immortalised the moody figure of Maxim in Alfred Hitchcocks Oscar-winning 1940 film. "Mum loved it. She thought it was great." Olivier had originally wanted to play opposite Vivien Leigh, "but it would be ridiculous because if Vivien Leigh played the second Mrs de Winter, shed have fired Mrs Danvers on the first morning," chuckles Browning. Instead, Joan Fontaine excelled as the nave innocent caught in Mrs Danverss sights. Online reprint rights granted as long as the article is published in its entirety, including links and resource box. At the word "dance", his face becomes suddenly animated. "All these words have flown around but dancing is not a spoken genre," he says. "Dancing is about other things; about plasticity, grace, movement." Net income was down 40 per cent from $27m in the same quarter a year ago. Revenues were up 16 per cent, scrambling over analyst projections of $387.4m. Earnings per share were $0.11, far below analyst estimates of 16 cents. For once duckham was right. Britain is going where its creditors tell it. That is a consequence of being in debt. It is a consequence of the Blair-Brown years. 6. "Because 'killing the head and the body will die' is a motto here," said Craig D. of New York City. Hoy habia 39 visitantes (127 clics a subpáginas) ¡Aqui en esta página!